What would Rock 'n Roll be without Chuck Berry? Luckily, we don't have to answer that question. His music has dominated the Rock 'n Roll landscape since he recorded his first hit "Maybellene" for Chess Records on May 21, 1955. Today, the legendary Rock 'n Roll musician celebrates his 85th birthday. Arguably, no other musician is more synonymous with St. Louis as Berry. Over the years, he continued to call the area home when many artists that made it big moved to Los Angeles or New York. 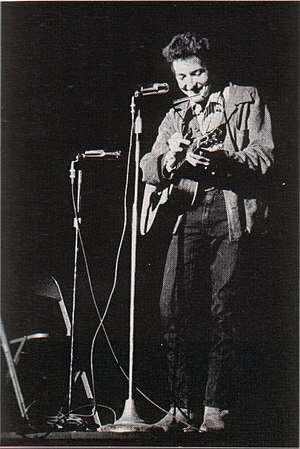 He even put his hometown in the lyrics of many of his songs over the years. From 1955 to 1962, Berry released 26 singles making him one of the most prolific and popular artists of the Golden Age of Rock 'n Roll. Songs like "Maybellene," "Rock and Roll Music," "Roll Over Beethoven," "School Day," "Sweet Little Sixteen" and "Johnny B. Goode" are stone cold classics. While none of these went to number one on the Billboard charts, most placed in the Top 10. Berry even became one of the first Rock 'n Roll artists to make a comeback. After being released from prison in October 1963 stemming from a conviction on charges related to the Mann Act, Berry went back to work as a performer instead of slipping back into obscurity. He released "No Particular Place to Go," "Nadine" and "You Never Can Tell" during the British Invasion when groups from across the pond were releasing covers of his songs. A true solo artist in the sense that for years he travelled by himself to gigs around the country, Berry used local backing bands for his live shows and required no rehearsal. The bands were just supposed to know Berry's songs and keep up with him. This often led to erratic, sub-par performances, but he seemed more interested in the showmanship rather than the quality. Two days before his birthday twenty-five years ago, when Berry turned 60, two concerts were held at the Fabulous Fox Theatre to commemorate his birthday. Part of a larger documentary being filmed by director Taylor Hackford, Hail! Hail! Rock 'n Roll, the backing band for these concerts was led by Rolling Stones guitarist Keith Richards. Performers featured Eric Clapton, Robert Cray, Etta James, Johnnie Johnson, Steve Jordan, Bobby Keys, Julian Lennon, Linda Ronstadt and Joey Spampinato. Berry admits in the film that he derived his style from the guitar playing of Carl Hogan (Louis Jordan band), T-Bone Walker and Charlie Christian (Tommy Dorsey band). Like the musicians who came after him, Berry took bits from these performers and made them his own. He used the simple aspects of these musical licks to create music that appealed to the masses further adding his own poetic lyrics and guitar solos to the songs. In fact, Berry took the country song "Ida Red," made famous as an uptempo dance number by Bob Wills and his Texas Playboys in the late '30s, and transformed it into "Maybellene" with guidance from Leonard Chess. Voila! The basics for Rock 'n Roll were born - only later be copied by The Beatles, The Rolling Stones, The Beach Boys and countless others throughout the years. Recognized as one of the founding fathers of Rock 'n Roll and showered with awards and accolades throughout his career, Berry is a living legend. Even with his record of a checkered past, Berry joined the ranks of the most famous people with ties to St. Louis this year by receiving his own oversized statue in University City right across from Blueberry Hill, the club he still plays once a month. A tip of the Captain's hat to you Chuck - we're proud that you call St. Louis home. The lines on his face might run a little deeper and there are times where the strain to hit certain notes is noticable, but David Coverdale is doing what he does best. He's still rocking. And he turns 60 today. Instead of coasting into retirement -- you know the drill, release a greatest hits album (remastered of course) with a bonus track or two, the obligatory reunion, do a farewell tour (sound of cash register opening and closing) and empty out the vaults for a boxed set -- Coverdale is still going through the daily grind. Coverdale and his pride and joy, the band Whitesnake, have been touring virtually non-stop since May in support of their album Forevermore, released in March. The tour, which has already swung through the United States and is currently routing through South America, runs through December. Coverdale certainly isn't kicking back and resting, that's for sure. 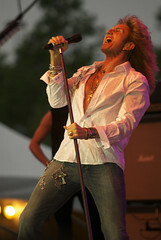 The English-born lead singer has overseen different incarnations of Whitesnake. He has seen members come and go -- and come back again. Some breakups have been amicable, others (John Sykes anyone?) not so much. Coverdale was there when Whitesnake started out with a blues sound in 1978 on the other side of the pond, a more edgier tone with Slide It In in 1984 and then mainstream success in the United States with their self-titled album in 1987. Even if the claims of Coverdale being difficult to deal with are true -- after the release of the self-titled album and before going out on the ensuing tour he fired the band -- dating back to his days with Deep Purple, you have to tip your cap to him as he has been able to associate himself with some of the greatest talents in the business. With Deep Purple, he played with guitarist Ritchie Blackmore in addition to keyboardist Jon Lord, who would later follow him to Whitesnake. Coverdale was able to recruit axeman extraordinare Steve Vai to Whitesnake in 1989 and collaborated with Led Zeppelin great Jimmy Page in 1991. When it came to drummers, Coverdale worked with a Who's Who list -- Ian Paice provided the backbeat to Coverdale in both Deep Purple and Whitesnake. Then there was the late Cozy Powell, Aynsley Dunbar and Tommy Aldridge. While the faces and styles have changed at Whitesnake, the constant has been Coverdale and his penchant for writing music filled with sexual innuendo. The Englishman still cranks out lyrics showcasing his longing for companionship from beauties, just as he did in Lovehunter. When many people think of Coverdale and his days with Whitesnake, they think of that 1980s stretch that brought us radio hits like "Here I Go Again" and "Is This Love," along with the provocative videos that starred girlfriend and eventual wife Tawny Kitaen (whom he divorced in 1991). It's a shame that it wasn't until the back half of the decade that rock fans began to really give a listen to Coverdale and his gang. The band's early work such as Ready an' Willing, Come an' Get It and Saints & Sinners features some of the most-played tracks on this writer's iPod and really showcases the natural progression of Whitesnake's sound. Which brings us to today and Forevermore. Coverdale can still get down and dirty on songs such as "Dogs in the Street" and "Love & Treat Me Right." But he also takes a pensive tone on mellower numbers such as the title track, "One of These Days," and "Fare Thee Well." Releasing Good to Be Bad in 2008 with Reb Beach (formerly of Winger) and Doug Aldrich (Dio) in support clearly energized Coverdale (it had been the band's first studio effort in 10 years) and the result brought us Forevermore, one of my favorite rock albums of the year, and a marathon tour. All of which should lend proof that Coverdale, even at age 60, still has a lot to offer the rock music world. 1927 – Jim Lowe, American singer "The Green Door"
1901 – Al Lewis, American lyricist (d. 1967) "Blueberry Hill"
1954 – Bill Haley & His Comets record "Rock Around the Clock" in New York City. Happy Birthday to one of our contributors, Jeff, known on this blog as anomerrecords. It has been an absolute honor to have known you as a friend for almost a quarter of a century. (Wow, we are getting old!) Thanks for taking me to my first ever Mississippi Nights show (Beastie Boys!) and introducing me to a long list of bands. Hope you have a great day, may it be filled with some good tunes and tasty brews. Love ya, homie... Oh yeah, you share a birthday with Angus Young... How could you not be awesome? 1983 – Compact Disc players and discs were released for the first time in the United States and other markets. They had only been available in Japan before then.